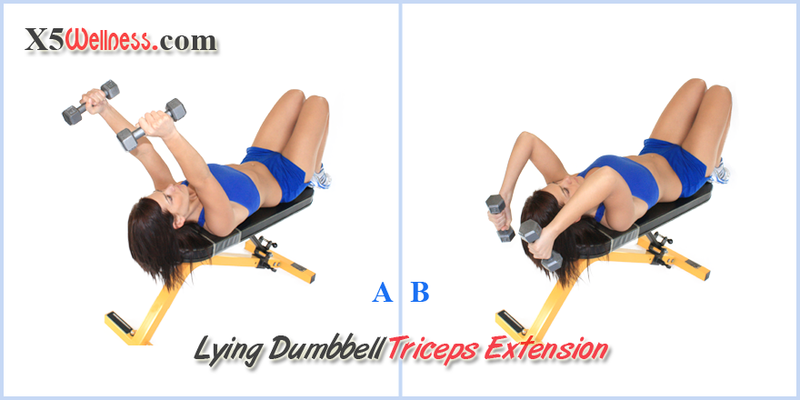 Lying dumbbell triceps extension is an isolation exercise with a focus on the extension of elbow joint. In any isolation exercise, you need to stabilize your body and restrict your motions so that only your elbow extends resulting in straightening your arm. Any motion in the shoulder joints will reduce the effectiveness of lying dumbbell triceps extension exercise. Hold two dumbbells and lie on a flat bench. Head and neck is in a neutral position. Arms are parallel to each other with elbows pointing towards your hips throughout the exercise. Extend your elbow which results in straightening your arms without locking your elbows. Lower your straight arms toward your head slightly below the vertical line until you feel the tension in your triceps and lats. (Position A in the picture.) This is your starting point and ending point. Your triceps remain fully engaged in this position. If you allow your arm to return to the vertical line, your triceps rest, and you have to work harder and longer. Exhale and return to position A. If you feel pain or discomfort, stop and check with your health care professional. Keep your back flat on the bench. Focus on controlled flexing and extending the elbow. Avoid external and internal rotations.